Spring is in the air—literally—as Disneynature prepares to unveil “Wings of Life,” a spectacular, closer-than-close, high-definition look at the intricate world of butterflies, hummingbirds, bees and bats, and their life-sustaining collaboration with flowers. 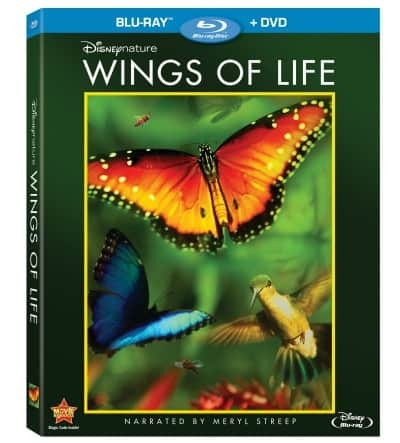 Directed by Louie Schwartzberg (“America’s Heart & Soul”) and narrated by Academy Award® winner Meryl Streep, “Wings of Life” will be available on Blu-ray™ Combo Pack, Digital and On Demand on April 16, 2013—just in time for Earth Day. I’m a big fan of Disneynature and was anxiously anticipating the release of their newest addition to the family: Disneynature: Wings of Life. From just looking at the cover, I thought it would be a film about butterflies and birds, but it’s actually all about flowers and pollination and the important role these winged creatures play in their survival. I think this has to be one of the most captivating and beautiful films I’ve seen in a long time. You need to see the cinematography! Not only were the colours absolutely stunning, but the audience is able to get up close and personal with creatures that we normally don’t pay much attention to: insects. You could actually see their faces and make out their facial features. It made me look at insects in an entirely different light. They have a HUGE role to play in pollination and without them, flowers like we know them would not exist. We first meet the Orchid bees looking for orchids in a lush rainforest. The bee finds the flower and has to climb a waxy slope to get at the scent it needs to collect in order to attract a mate. However, the flower is designed to ensure it’s own survival and the bee falls into a bowl of secretions. There’s only one escape route and it’s exactly where the orchid wants him to go. When he does finally escape, he is gripped by the flower while it implants its only two pollen pods it will ever make on the back of the bee. It holds him there until the glue is dry and then releases him. The bee then flies to the next orchid with those two pollen pods and pollination occurs. Isn’t nature extraordinary? I also enjoyed hearing the story of the Nectar bats of Northern Mexico. They live on an island and fly at night to the Sonoran Desert to feast on the flower of the cacti. Without these flowers, the bats would not survive. The bats in turn aid pollination and ensure the survival of cacti. As you can see, it’s a give and take relationship where one cannot exist without the other. Another part I really liked was the segment on the Monarch butterflies. They make the longest migration of any insect. They travel to the US Midwest and Canada every year just for one thing: milkweed! I also learned that the reason the Monarchs are orange and black. It’s to warn predators to not eat them because they are poisonous. 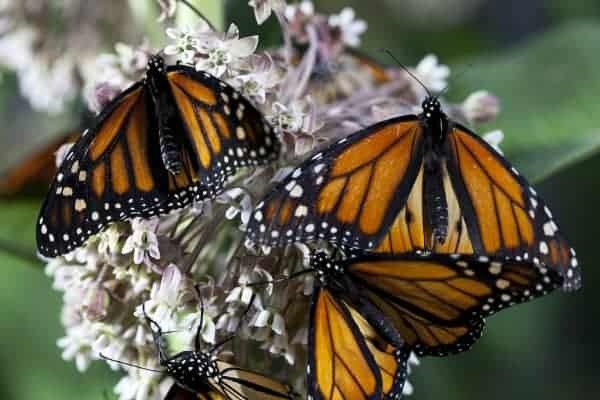 Milkweed is poisonous to every other creature, but the Monarch butterfly. I plan to show my daughter this movie because I think she will really like it and it can teach her about the wonders of nature. Check out my other reviews of Disneynature films including Oceans, Chimpanzee, The Crimson Wing and African Cats. How neat…we are studying insects in our homeschool this semester. I will have to get this DVD! Nice review….thanks. Wow! This looks like such an amazing movie! I am just in love (and enthralled!) with nature films like this – the world is truly a magical place! This movie looks amazing and I think my son would enjoy watching it! So cool. I would love to see something so beautiful. This would be awesome to have for my grandkids! I remember growing up and learning about butterlies through books, but I’d rather learn through blu ray! I originally didn’t think I would like movies like this, but I’ve found I actually do! I love Nature movies and anything to do with animals and pretty butterflies. This looks like a relaxing movie that I would love to see with my son and sister on a Sunday. Hello, Stacie. Nice to see the preview. You are so right the colours are so vibrant and bright. This DVD looks amazing. I know my Mother would love it. HMMM… Maybe a Mother’s Day gift. Thank you for this review Stacie and the preview from Disney. This looks like it’d be beautiful to watch 🙂 My daughter loves butterflies! looks like a beautiful movie! !